People who like to listen to audiobooks should be no stranger to Audible. It’s a company that produces and sells spoken audio entertainment, information and educational programming on the Internet. The company’s bought by Amazon in 2008 and is now a subsidiary of Amazon. Audible offers audio content like audio versions of magazines, newspapers, audiobooks and radio. It’s now the biggest downloadable audiobook producer in the world. You can purchase and download all kinds of audiobooks from Audible. The audiobooks you download from Audible are usually in AA or AAX format. They all have DRM protection which is used to prevent the audiobooks from being used and distributed without limit. Audible has its own program for playing the audiobooks downloaded from Audible’s website. You can also play the Audible audiobooks with iTunes. Also Audible has developed its own apps for handsets running different mobile operating systems. But the playbacks on all those devices depend on Audible’s own app, which means you can’t play those AA audiobooks with a third-party audio player. And non-audible-approved devices wouldn’t be able to play them, either. The only way to play Audible aa audiobooks on non-audible-approved devices and with other audio players is to remove the DRM protection from those Audible AA audiobooks. Check out the content below to see how to convert AA audiobook to MP3 on Mac for playback with other audio players. To convert AA to MP3 Mac users are going to need help from a DRM removal tool. The program that I’m using in this post to convert Audible AA audiobook to MP3 on Mac is Leawo TunesCopy Ultimate for Mac. It’s an all-around DRM removal program that allows Mac users to remove DRM from iTunes music, video, audiobooks and audiobooks and Audible AA/AAX audiobooks. And the converted media content will be saved in ordinary file formats. As for the AA audiobooks, this DRM removal tool can remove DRM from them and convert them directly to MP3 without needing an audio converter. Here are the instructions for using Leawo TunesCopy Ultimate to convert AA to MP3 Mac users could follow. Step 1. 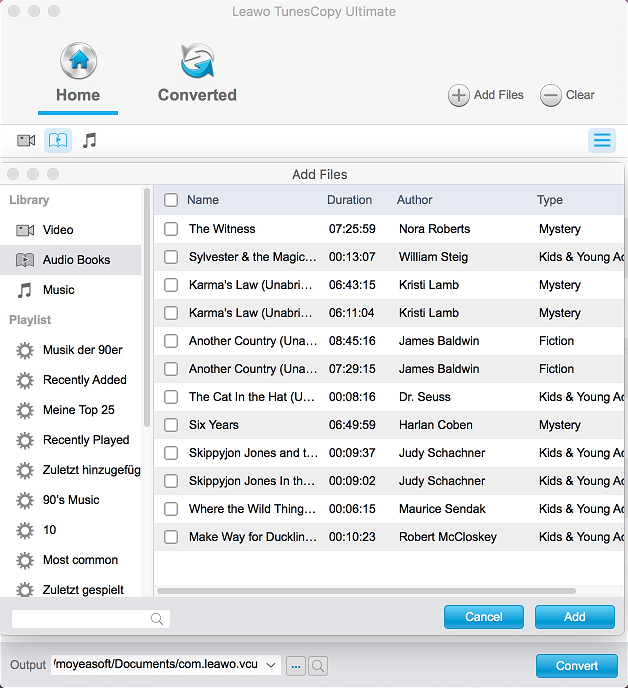 Import AA audiobook to Leawo TunesCopy Ultimate for Mac. 1. Click the Add Files button and then select the audiobooks from the iTunes library. This step would require the authorization from Audible. When the Audible authorization is needed, you will be redirected to Audible’s website. Just sign into Audible with your Amazon account and the authorization is done. 2. If you can find the source AA audiobooks you download from Audible in the Finder program, you can directly drag those AA audiobook files to the interface of TunesCopy to import them to the program. And in this way you can directly import the AA audiobooks to the program without needing the authorization from Audible. The audio parameters are provided to you for edit. If you want to make changes to the parameters of the AA audiobooks, select the audiobook file you want to edit, and you will see an Edit button to the right of the title of the audiobook. Click on it to change the audio parameters as you like. The audio parameters you can change include: Bitrate, Sampling rate and Channels. Step 3. Set up output directory for your AA audiobooks. The default output path for the output file is shown in the bottom left-hand corner in the Output option box. If you want to change the default output directory, just click on the “…” button next to the Output box and set a new output box on the following dialog box. Step 4. Start removing DRM from Audible AA audiobooks and converting them to MP3. After finishing the above 3 steps, you may start the DRM removal and conversion process. 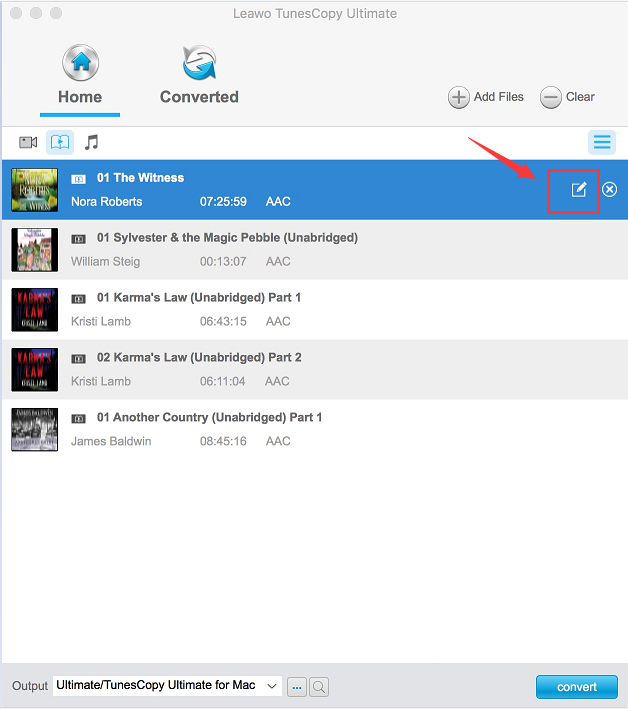 Find the Convert button in the bottom right corner and click on it to start the whole DRM removal and conversion process of your Audible AA audiobooks. You can check out the progress of the process on the interface. That’s the simplest way to convert AA to MP3 Mac users could use. After this process is finished, your Audible AA audiobooks will be converted into DRM-free MP3 audio files. And then you would be able to play them on handsets that are not Audible-approved.